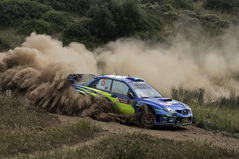 Both Petter Solberg and Chris Atkinson demonstrated the stage-winning pace of the Subaru Impreza WRC2006 on the final Leg of Rally d’Italia Sardegna. Petter secured two stage wins while Chris set his first fastest time of the year, however problems in the final stage of the rally cost both drivers places. A bent steering arm dropped Petter to ninth while accident damage relegated Chris from fifth to tenth. This has been a difficult rally for us with a lot of highs and lows. Overall Chris has had a very encouraging event. His performance has been at a good level throughout; he’s been focussed and consistent. He was unfortunate on the last stage when he was distracted by some dust in the car after a very good run in the morning. Petter has had a tough time. When things have worked as they should he has been able to win stages but we have work to do to improve the whole tyre and car package so we can give him and Chris the opportunity to compete for podiums during the rest of the season. It’s been a hard event for me. I tried as hard as I could all weekend but the overall result is disappointing. There’s not really a lot more to say. We’re looking forward to the next event now. I like the Acropolis Rally a lot and I’ll give it my best shot. Overall I’m happy with how I’ve driven on this rally. Before the last stage we had gone consistently all weekend, made no mistakes and had kept a good pace. Obviously to end the rally like we did is very disappointing, but there was a lot of dust coming into the car and I got distracted. We will be targeting a better finish next month in Greece.